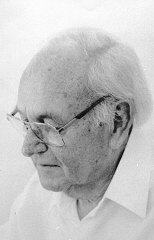 François (Flooi) du Plessis was born on 8 January 1918 in Petrusville, where he grew up. He studied at Stellenbosch University (BA 1938). In the following year, while studying for his MA, he was recruited to join the Parliament Library, at the same time attending lectures in Librarianship at the University of Cape Town. In 1943 he was appointed organizer of the Society for Book Distributions, which later became the Cape Library Services. He was also responsible for the Cape Library Extension Association which promoted library services for the Coloured community. He helped develop the Cape Libraries, an organ of the Cape Library Association and was president of the South African Library Association from 1962 to 1964. He joined Stellenbosch University as sub-librarian in 1945 and lectured in Book Selection and Reference work at the newly established Department of Librarianship (1956 -1961). From 1968 he served as Librarian until retirement at the end of 1983, when he moved with his wife to Clanwilliam. He took a keen interest in sports, coached a Rugby team and was president of the University's Cricket Club 196? -1975). He was Editor and publisher of Huis en Haard, the official organ of the W.A.A.C.P. Member of the board of the van Riebeeck Society. Member of Intervarsities Library Committee and Convenor of the Northern Cape Regional Committee. François was married to a member of his staff, Doreen, née Wookey, in 1949, and they had four children, a boy and three girls. In 1960-61 he and his wife toured America, visiting libraries on a USA-South Africa Leader Exchange program. In 1992, The Africana room in the University Library was named after him. Aan 'n vlot en 'n nasie gebou.